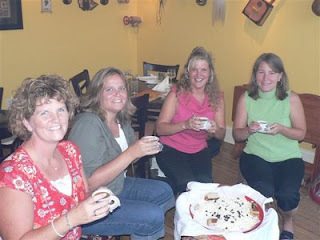 Last night (Thursday) some good friends took me to dinner at the The Blue Nile Ethiopian restaurant in Harrisonburg. 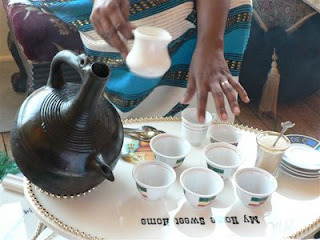 We had some authentic Ethiopian Food and a coffee ceremony. 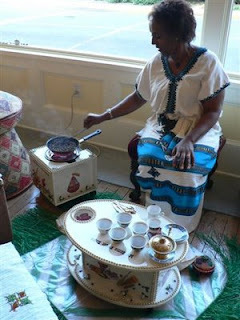 The lady who did the ceremony was actually from Ethiopia and came here 26 years ago. Her story was fascinating. She said to bring A up there when we come home and that she would help us. I can also order food to go. 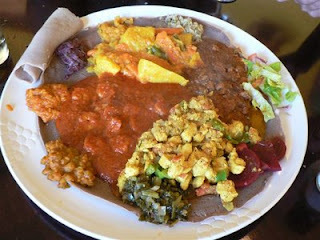 No more trying to cook injera!! She said she even had a hard time cooking it here. She thinks it is something with the altitude. We also found out that we have been saying his name wrong ! Glad that I got that cleared up now! How wonderful that your friends did this for you. What a blessed woman you are...and what wonderful pictures of your blessing. How sweet was the offer for the woman at the restaurant to help you. Truly she meant it...so sweet. God is so good, I am crying at how His hand is on you and working through the details, to bring you joy and His perfect peace.